- Visit our Videos Page to see footage from the west coast TV show, Fisherman's Heaven, of Bob & the show's hosts chasing Kasilof River Silvers! 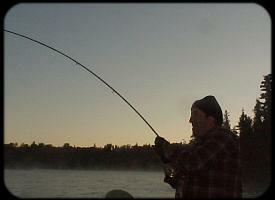 - Visit the Photo Gallery Pages for loads of photos of Kasilof River King Salmon Action! One of our most popular guided trips, float trips for silver (or Coho) salmon fishing on the Kasilof River are offered from early August through the of the month, otherwise known as the early fall of Alaska. A run of fairly short duration, the fishery provides about three weeks of exciting fishing before waning at month's end. 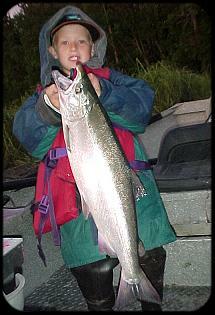 Silvers during this time run about the same size in both the Kenai and Kasilof Rivers: most years averaging about 7-10 pounds, with a good percentage of the fish in the teens. Silver fishing is responsible for lots of big smiles! Some years, better ocean feeding conditions will allow average the silver salmon to average over ten pounds with regular catches of 15-17 pound fish. Trophy-class, twenty pound silvers are possible in these years. A very popular fishery amongst our guests with kids, silver fishing can be very fast-paced at times with double and even triple-headers keeping all anglers on their toes! Although smaller than their Chinook (king) salmon relatives and lacking the prolonged runs of the kings, these fish entertain anglers with their acrobatic antics ... often cart wheeling and leaping time after time upon being hooked. August is the only summer month where you can actually fish before sunup! When a silver fresh out of saltwater grabs hold of your bait with less than a rod's length of line out, hold on! Their initial leap is often just inches from the edge of the boat and will leave your fishing partners rolling in laughter as you try to play the fish while wiping the water from your brow that your adversary on the other end of the line just so rudely sprayed you with. 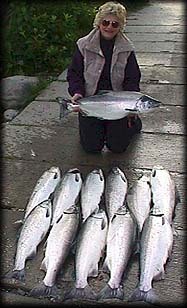 As with our king salmon charters, most of our silver salmon fishing takes place in tidewater. However, on occasion, depending upon fishing conditions ... we might choose to fish the beautiful upper Kasilof from its emergence from Lake Tustumena downstream. Loads of silvers just hours out of the salt!